The village of Santo Tomas struggles to survive in a market that is threatening its sources of livelihood and endangering the integrity of both its families and humanity. Export is a personal story of a village engaged in the labor-intensive process of coffee farming. The people of Santo Tomas live off the map - in a lush remote cloud forest on the very fringes of the social and political reaches of modernity. Their lives have a daily rhythm and routine that reflects hard work, dedication to family, and a deep yet understated reverence for the integrity of a broader human community. The market for coffee is volatile, and has caused a third of households to make the ultimate sacrifice. Risking life and limb to travel to the United States in pursuit of a more stable livelihood, Ernan shows us the dehumanizing effects of coffee poverty on the familiar rhythms of peasant life. 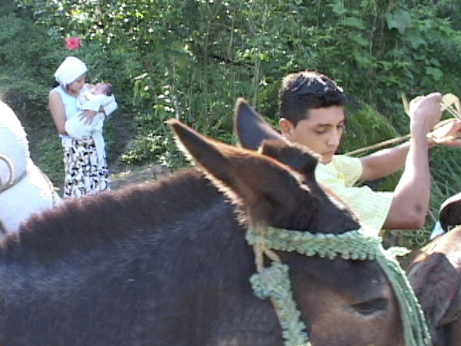 We follow Juan Angel as he transports two large sacks of coffee on the back of a mule for a two-hour journey down the mountain. Juan Angel narrates the journey with a description of his values and goals in life: earnest, spiritual, and consciously free of the quest for material wealth that is all so familiar to an American audience. As he parts with his coffee it is as if Juan Angel is leaving a dear friend, reluctantly dumping it on the middleman’s patio to dry as he is paid $42 for 143 lbs.